The Indecision Day Candle is a day where neither the sellers nor the buyers took total control of price, and moved it strongly in one direction. Indecision days are mostly very small bodied candles with small wicks and tails that are longer than the body. They often form in consolidations, or during periods of sideways action. However they also occur as a severe anomaly during extreme sell-offs that rebound in the same day, due to the new circuit breakers the SEC has installed in the automated market place that slow down selling during a fast paced selling spree. The stock chart below of Ameriprise Finance Inc. (NYSE: AMP) is marked with a red arrow on 8/24/15 to show an example of an extraordinarily large Indecision Day Candle. Extraordinarily Indecision Day Candles can be problematic for Technical Traders to know how price will behave next. These create extreme patterns in Price and Time Indicators such as MACD, Stochastic, and Bollinger Bands® as well as other highly popular indicators making the interpretation skewed in reaction to the severe price pattern. The extraordinarily indecision day is caused by a Market Event or Global Event, and therefore doesn’t represent the trend on that day. 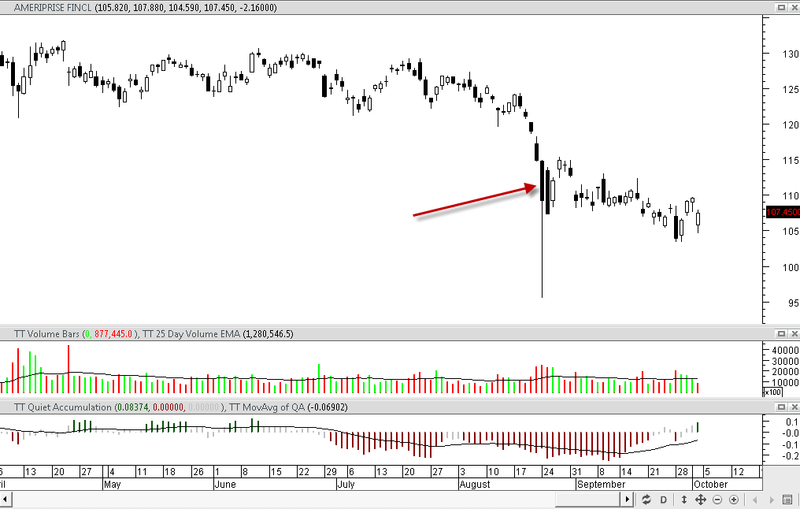 If the stock has already been Trending Down, the rebound within the indecision day can be huge on that day. However most of the time the following day will be a down day, continuing the original trend. If the stock is in an Uptrend, the extraordinarily indecision day will be followed most often by gap up that sells down creating a black candle. The following days the stock will slowly sort out the selling and return to the uptrend. If the stock was in a Topping Formation that had not completed prior to the severe indecision day candle, then the following day the stock may move down without a gap up at open. Then volatile action up and down with larger than normal candles tends to follow the topping completion, before a true Downtrend develops. Extraordinarily Indecision Day Candles temporarily alter the trend, and it can take weeks to pattern out the price action and return the trend to its true direction. During that period of time the stock may run up on what appears to be a reversal pattern, only to hit mild resistance and fall steeply. When trading after an extraordinarily large indecision day caused by a major global event or shock to the market, it is important to not trust the Price and Time based indicators but to watch Volume, Volume Oscillators, Accumulation and Distribution Indicators, and Large Lot versus Small Lot Indicators to determine the short term direction the stock will take before the anomaly is patterned out of price. Copyright©2015 Decisions Unlimited, Inc. dba TechniTrader. All rights reserved.